Imagine creating amazing street art murals, graphics or graffiti tags anywhere you wanted and in a completely legal why. Now imagine getting paid for it. Well, one featured Web Urbanist street artist group does exactly that. The urban artists of Symbolix selectively clean the uban environment, leaving behind slogans, words and images of major companies and product releases. This group has managed to turn a street art hobby into a guerilla marketing campaign strategy. The above murals are excellent examples, similar to those shown in the prior Web Urbanist post, of selective cleaning as urban street art. They show the range of possibilities, from typical tags to complex social messages. 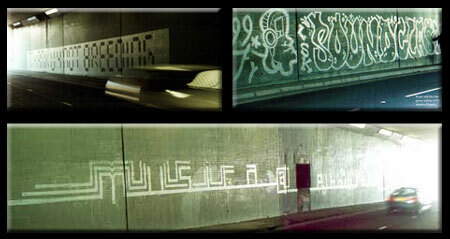 All of these are, of course, completely legal – reverse graffiti that boggles the authorities. It is truly remarkable how the Stashpoint slogan stands out against the dirt and grime of the urban subway system. It is easy to imagine how a company would recognize the value of such a guerilla marketing campaign: these images are far more compelling than a typical framed advertisement in public. This Big Brother guerilla marketing campaign is similarly prominent. In particular, in the left image, this branded image of an eye truly stands out from its surroundings. In fact, at least in the photograph, the image seems to stand out more than the sign it is written on. This campaign for Hype really demonstrates the variety of possibilities inherent in reverse street art guerilla marketing. Simply by removing a layer of posters, for example, the letters clearly stand out in the left image – as if they were creatively drawn on. On the right, the potentials of erasure on different media are revealed. Together, even this simple repeated word takes on new life in relationship to various backdrops and settings.